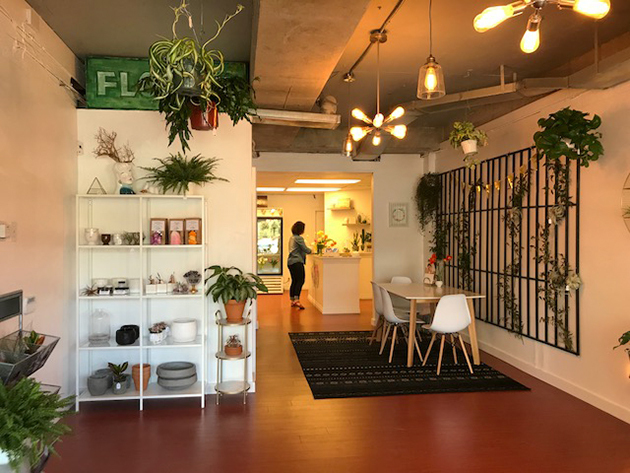 When Carlee Donnelly opened a storefront on the Ave on April 6, 2018, she was fulfilling a lifelong ambition. "I have a degree in public health but a flower shop was my dream as a little kid," explains Donnelly. How did she get started as a florist? "I was a bridesmaid in a wedding and really liked the flowers." She talked to the florist about working with her and learned the business as a freelancer working at events. Now she does weddings all over Washington state and as far away as Idaho and Oregon. How did Donnelly decide on her U District location? "I saw a real need in the neighborhood. There had not been a florist for years. And the rents are more affordable," she notes. While the store functions as a design studio, and meeting space. Donnelly also sells house plants of all varieties, floral arrangements, jewelry, and other locally made gifts. "College students can buy a small plant for a dorm room and an affordable gift," she says. Donnelly is committed to supporting local farmers. Instead of using cheaper imported flowers, 90% of her flowers are sourced locally. How does she deal with limited options in the winter? "I have to be more creative as seasons change."